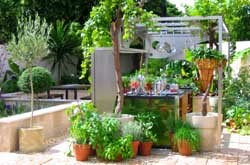 Enjoy wining and dining outdoors with family and friends by creating a social magnet of an outdoor kitchen. Eating outside on a perfect summer's evening can be a great and unforgettable dining experience. Whether it's just you and the family or a dinner with close friends, you can have a fabulous outdoor dinner by creating an outdoor kitchen atmosphere that's warm and inviting. If you are the homeowner, you have the freedom to spend money on building alterations that will add value to your home. If you are renting a home, it may be difficult for you to make alterations, unless you confirm these with the landlord. But, ultimately, these factors need to be considered, first and foremost. Before you get started, go outside and have a look at the space that you have available to you. Do you have room for all the elements that you would like to include? Decide exactly what you want and visualise the elements in their place: Do you want to include a wooden deck, round, square or rectangular patio table, deck chairs, umbrellas? Do you want to have a gas or coal braai? Plan the layout by deciding where you want the focus of your main social area to be. For some it may be the patio table, for others the Jacuzzi or braai area. If you choose the patio table, think of table options that will fit in nice and comfortably, that would make your guests want to stay in that area. If your focus is on the braai area, why not set up some stools or benches to make this area more social? Other great ways to add style to your outdoor dining is to colour co-ordinate your table linen and chair cushions with the season's hottest colours. Think place mats, candles (even if you're not going to use them), vases and centrepieces as well as flowers. Some local home stores have great concepts that don't cost too much, which allow you to snazzy up your outdoor experience.